Some dollhouses are cute, some are drowning in the color pink, and some — like the extra-special Emerson House from Brinca Dada — are more like a work of art. With six rooms — a living room, kitchen, library/office, master bedroom, bathroom, and child’s bedroom — Brinca Dada calls it the perfect home for the modern family. One lucky Inhabitots reader will win the Emerson House fully furnished with a 32-piece contemporary furniture set — a prize worth $549! 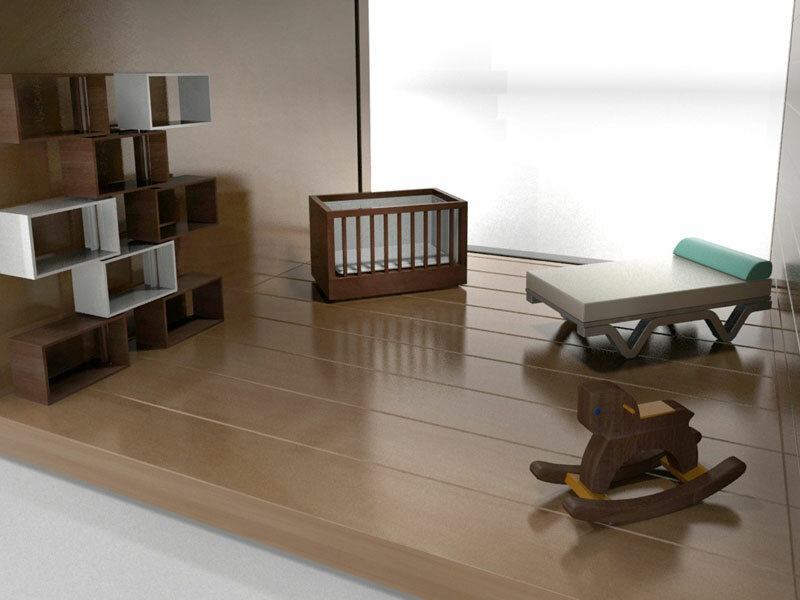 The dollhouse is made with non-toxic and lead-free wood stains and paints and it comes complete with eco features like solar panels and recessed LED lights. Find out how to enter to win after the jump. 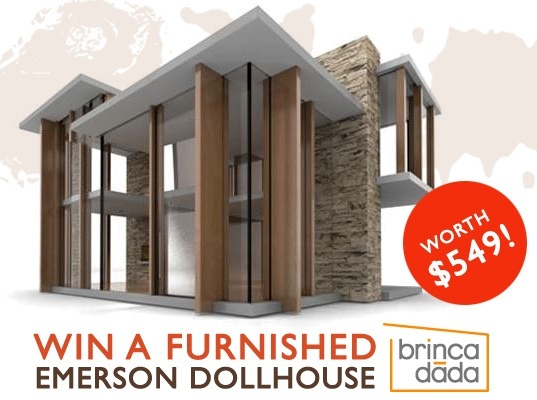 Here’s how to enter to win a Brinca Dada Emerson House and Contemporary Furniture Set worth $549! 3) Add a comment to this post with your answer to the following question: What green design feature would you dream dollhouse (or full-size house) have? Contest ends Sunday, December 12th, 2010 at 12 midnight EST. Winner will be announced in the following week’s newsletter! My *real house would have solar panels for sure... this little one will serve as inspiration! Fingers Crossed!! My green design would be Bamboo flooring, in my house (Doll house) love it !!! My dream house would have TONS of solar windows on the sides and rooftop. By TONS I mean let's do the entire roof in Solar Panels! Would that be insane or what? I LOVE this house. My architect husband does as well, not to mention baby! I would make solar energy a must in my dream home. An indoor composting system. Just push those veggie trimmings right into a hole in the counter, then pull out lovely soil for the windowsill garden. aahhhh. I have been mooning over this dollhouse like a little kid at Christmas. I adore it. I'd love to have a home that took advantage of upcycled and sustainable building materials, as well as floor and wall treatments that don't off-gas (although I suppose the latter is more relevant to a real home; dolls don't often have asthma). I would love a dollhouse that had solor panels. Looking forward to incorporating them into our own home someday as well! I'd like super-insulation in my real house to keep the family hearth warm and draft-free. Not so important in the doll house, but it couldn't hurt! I wish my house and a doll house that had recessed LED lights. It would be very cool!! Solar panels would be awsome. And rain barrels would be a nice touch too. My very modern designed dream dollhouse (or full-sized house) would be built with all sustainable green materials as well recycled materials wherever possible. To keep the house low-energy and reduce the impact of building new, the house would also have solar panels, a green roof, energy efficient glass/windows as well as overhangs to reduce the heat gain within. oh my word, there's so MUCH I'd add to a green dollhouse, and to my own home! Rain barrels are a must (and maybe a rooftop garden? yes, definitely that). Solar panels, and incorporated recycled materials into the actual siding. Radiant floor heating. Motion sensors to reduce energy usage throughout. An urban farmer's dream yard replete with a hot compost and chicken coop. And art! Art everywhere from upcycled materials. And a bike rack. Right out front. this would be a sweet doll house! I'd like to see a variety of options for the doll house, with a manual explaining the effects of their choices on the environment; then, let the children order them separately. What a great way for children to learn about making green choices. (ie. tankless water heater vs. solar water heaters, flooring, accessories like cloth shopping bags and recycle bins, compost bins, STAR rated appliances, etc..) If I had to narrow it down to one feature, I would choose solar panels. I would put in Bamboo flooring! Solar panels (as everyone else mentions). Plus, heated flooring. My house would have solar panels and LED lights...it also wouldnt be packaged with any extra boxes or plastic. I'm tired of opening children's toys and having to recycle or trash all of the obnoxious packing material that comes with them. There are sooo many things that I want! Definitely no carpet - bamboo or old wood floors; no VOC paint; FSC certified materials; recycled glass/cement countertops; green roof; solar panels; radiant heated floors from geothermal... the list goes on! I've been dreaming of solar panels for a while now. Living in Florida, it just doesn't make sense NOT to build houses with them! A wind farm and composting toilets for sure! The entire house would be made from reclaimed pieces of condemned dollhouses. my dream home would make best use of electricity self generation given its site- wind, solar, geo thermal- in combination so I wouldn't be using any power company services. Solar panels, and lots of ways to capture rainwater for a garden. Hello everybody! I simply adore this Brinca Dada Emerson DollHouse! It's really a very cozy beautiful house with perfect contemporary green design! Especially I love that this house has big windows which bring plenty of sunlight. I imagine what a delight to live into such dream house built in natural size. My amazing Brinka Dada Emerson House will also have a green living roof. Green living roof will complement this fabulous eco-house adding lots of benefits including aesthetic. I am very excited to win this cute Brinca Dada Emerson DollHouse as a Birthday gift for my adorable Arina. A synergistic organic garden where I could grow my own fresh vegetables for my family and friends (full-size house) or have the kids grow sprouts (dollhouse). My own garden and a rain collection system! mine would have a rooftop garden! How about a tiny herb garden to teach kids about growing their own food :) This dollhouse is amazing! What a great way to teach kids about living sustainably. My dream *real* house would have solar panels, reclaimed everything from counter tops to flooring, hemp & organic cotton furniture and curtains, lots of windows, and a HUGE garden out back!! A dollhouse made entirely out of bamboo would be nice. I want a green roof on which I can grow vegetables. I don't even know if that exists, but that's what I want. Would love a green roof on our house. Not only are they energy efficient, I could also grow a garden up there and have a place to retreat from city life! I'd love to have wind mill power too! Would love a green roof. Not only is it energy efficient, but I'd have a garden up there and a place to retreat to from city life! I would love a rainwater harvesting system! I would love to live in a house that doesn't have any HVAC system. It would have a passive heating and cooling systems which utilizes cross-winds, ventilation, and allows me to connect to the fresh air. Solar Panels is a must! I would love it if my *real* house had solar panels! Oh, how I love this dollhouse! A house in real life would have to have solar panels and an organic garden, or perhaps a windmill in the backyard (if the neighbors didn't complain!). FSC-certified wood floors, zero-VOC paint, locally made wood furniture and some vintage pieces — I could go on and on! Oh, how I love this dollhouse! A house in real life would have to have solar panels and an organic garden, or perhaps a windmill in the backyard (if the neighbors didn't complain!). FSC-certified wood floors, zero-VOC paint, locally made wood furniture and some vintage pieces � I could go on and on! I have long coveted this dollhouse and can only dream about a lifesize version which would include, as everyone mentioned, solar panels and a green roof. Just "liked" inhabitots on FB, too. I would LOVE to have a solar panel system - on the dollhouse AND on my real house! This is a fabulous giveaway!!! I have signed up here, "liked" on facebook and commented!! GOOD LUCK TO ME!! Definitely a chicken coop and a rain catcher! Hey, I will love to win!!! Hey, I'm in!!! Love the house. Seems I am not alone in saying solar, solar, solar!! Plus, extra insulation (which we will hopefully have done before the end of this year :)). Would love a dollhouse and real house with solar panels. That would save some money! Made of recycled material - both doll house and real home. I always thought I loved old houses -- the history and character. Now, having owned an old house with SO many inefficiencies and no hidden charm, my overarching wish is to knock down this house (and reuse whatever pieces we can) and start completely over, on the same small plot of land, building a simple, super-eco-efficient house, and being at peace! Solar panels and passive solar. Awesome house! i would love to have solar panels and wind power. it needs a sustainable garden, complete with compost pile! I would like to win this -- thanks for the chance. I am an email subscriber. Our house is ICF (insulated concrete forms) which is very energy efficient. I'd also add geo-thermal heating & cooling and used recycled cabinets and materials. I would love to have the house to have solar power, made of eco-friendly materials and energy efficient appliances. I would love to have solar panels, a windmill, and rain garden! Newslettered and facebooked. I would like to see a dollhouse with a green roof and passive solar design. Count me in! Solar panels are a must, eco-friendly paint, wallpaper and furniture, and of course, bamboo floors!! I see I am not alone in my solar panels idea. It would be very cool to have lights come on that are completely green. Thanks! I would like a tankless water heater in either home! I would love a greywater / rainwater capture system to help me keep our urban earthbox roof garden growing! I totally want to build a net-zero house. With the technology and automation systems that rival almost any multi-million dollar monstrosity... just in a mid sized family home. I don't agree with being completely off the grid, but with some of the newest developments, all the extra generated utils can be sold back. I'd love to get a check every month from the power company... We've paid them all too long. I'd like to see a doll house come with as many green options as possible and a manual that explaining what effect the options would have on the environment. That would make the house more interactive for the child, and they would learn something about making green decisions. Some of the options could include solar water heaters vs. tankless gas water heaters, solar panels vs.energy from windmills, the materials the doll house is made of, including the flooring, accessories such as compost bins, recycle bins, cloth shopping bags, STAR rated appliances, etc. If I had only one choice for my house and the doll house, I would choose solar panels. My dream doll house would also have a Windmill! I would like cork or sustainable wood flooring, ceiling fans, solar panels and roof and 2 button flush system for toilets so as to conserve on water when flushing. What an amazing giveaway! I am already signed up for the newsletter and "like" Inhabitots on Facebook :) I would love to have my whole house built with non-toxic finishes and supplies! It always freaks me out how many toxins are released from things like carpet and furniture. My dream house would artificially degrade based on my conservation habits. For example, if I am wasting too much water, the heater would lower a few degrees making it slightly uncomfortable. But if it rained and my water catchment system recovered a lot of water, the heat would balance back up to a comfortable and efficient level. Water, electricity, gas, recycling and trash would all be measured and represented in some form. And when I made a significant improvement, my house would congratulate me on Facebook. It's not that far fetched and could be built by a hobbyist with cheap hardware like Arduino. I just need more hours in my day! I think I'll have to say a living roof... and it would be awesome on either a doll house or my real home! I would want bamboo flooring in my house. I would want bamboo flooring...and a green roof. My dream house would be built around a green house and have a garden on the roof! I'd love geothermal radiant floor heating in my real house, but I'd happily take a green roof on the dollhouse - especially if I could really use it to grow plants. Our top wish for our future dream house would for it to be a "Passive House" with a high R value in the walls and have a geothermal heat recovery system. Also, the use of active solar, grey water, rainwater recovery, and the use of sustainable products is a must. I would biy a eco washer and dryer. A garden- I would love to grow my own fresh produce but the military housing we're currently living in doesn't allow us to plant any! I would like an eco washer and dryer. Hello. I receive the Inhabitots email newsletter, luckyleigh(AT)frontier(DoT)com and am a FB liker, (Leigh Luck Smith). If I had to choose only 1 "green" aspect to add to a house, I guess it would have to be solar panels. Though it would be great to add lots of green things and be completely off the grid--the timer showerheads you mention on the FB page today, geothermal energy, energy-star appliances, maybe graywater recycling, nontoxic paints, sustainably developed wood, the whole shebang. Wow, what a cool house! I love that it's teaching kids about being eco-friendly too. My dream house, doll or otherwise, would have solar panels, a roof garden, a composting system in the kitchen as well as gray water recycling. And of course eco-friendly paint, fabrics and flooring. And maybe a windmill! We're probably using the exact DOLLHOUSE design to make our DREAM HOUSE - perfect layout, space, rooms, tons of light. We've been looking at endless plans online to build a new house and my kids looked over my shoulder, saw this awesome doll house and said 'can we have a house like that?" and we thought "why not"?.. Dream feature would be geothermal heating (including underfloor heating) so we use the energy the earth gives us, instead of consuming fuels to generate more. Kids think so much more clearly than us sometimes don't they! My green design feature would be a vertical garden. Imagine a team like Tim Boyle and Patrick Blanc working together to design the first ever 'Outdoor Dollhouse' with a vertical garden... brilliant! My 5-year old wanted a Barbie dolhouse from Santa this year, but this Brinca Dada dollhouse is a true dream dollhouse. Answer to #3: My dream dollhouse would have a sustainable organic garden and solar panels for the roof. Liked this site on FB and signed up for the newsletter. Both my own dream home and the Dollhouse would include an interior "Solarium" to both utilize solar energy for household systems and of course, growing trees, plants, flowers and edibles inside. Ooh. . . solar panels -- and maybe a living roof as well -- would be fantastic on my dream home. . .
My house would have solar panels, and a eco friendly water system inside and outside for the gardening. Solar panels, for both dream house and doll house! I'd also like a smart rain water and gray water collection system. solar panels would be awesome! as much recycled and green building materials as possible! Green roofing, plenty of reflective ceiling light tubes to let in the sunlight, and bamboo flooring or recycled carpeting depending on the room. I'd love to have no electric bill in my real house. I've always loved windmills so wind and solar power would be awesome. My dream green design house starts with the house itself. I hope to one day own a shipping container house, with an aquaponic garden, rainwater/greywater barrel and solar panels. This dollhouse is amazing! There are so many green features I'd like. It would be cool if the dollhouse had a living green roof so the kids could grow sprouts on it. My dream house and doll house would have a blackwater system. My dream house would have a swimming pool in my living room. My dream house and doll house would have an electric charging station so that I could drive around (if I had to..) in one of those cute new electric cars! My real house would have a glass roof so I can have lots of natural light and warmth in the winter (including shades in the summer), a greenhouse, tons of birdhouses, defiantly solar panels, and a nice big aquarium because they're gorgeous. A beautiful green garden, a water tank and solar panels ;-) What a beautiful dolls house! I would love to have solar panels for my own house & my child's dollhouse. I think it's great that this dollhouse is so modern & shows kids how to be environmentally conscious at the same time. Solar panels to power the LED electric lights! I Must Say this is by far the most amazing Doll House I have seen in all my researching! Beautiful Art~~~Spectacular design. Like everyone else, how cool would solar panels to run the LED lighting system be!??!!!! What about running water, and grey water recycling? maybe messy for a doll house.... A green house with little garden boxes...U could grow wheat grass or Chia seeds or other small seeds! A solar powered or electric car would be a nice addition! recycling station of course! Children learn by what they play! Love it! A dream real house and dream doll house would for sure have solar panels, a rain barrel, LEDs galore, huge double-paned windows, and a succulent garden. I would love to see a version of the window garden that some users are starting to support in apartment buildings. What a lovely way to reinforce the idea of growing your own food or at least supporting local. What a beautiful concept! I dream of adding solar panels to my house even though I live in rainy Seattle. I like inhabitots and get the weekly letter. The Emerson Dollhouse is awesome! We'd love to have solar panels & a windmill for all including home, tree, doll & dog house. Would it be ok to say this Mom would like Brad Pitt to be included in designing our perfect green dream house? I am a mother to be... kids fashion designer (also to be... I hope), love your blog that I find an inspiration. Started my own blog a couple of weeks ago (small homie production http://odipo.tumblr.com//). My husband is an architect that has specialized in eco-sustainable building and architecture. I am aware that is not only solar panels that make the difference, but also the quality and the hole process in every detail, and this does not mean to give up design and beauty, I am sure (because I know him) that we will have everything for a self sustaible home. You asked about a green design feature that I would love to have in my doll-house... the answer is.... i found this website the other day browsing Foldschool that is a progect of a Swiss-based architect Nicola Enrico Sta�bli, who made some furniture for kids "do it yourself" be shure that I will not only make this furniture for my own house and I do dream about it but if I get this beautifull doll-house I will make a model of this furniture to decorate my kids doll-house. My dream doll/real/any house would be off the grid! Rainwater system, solar panels, all material are sustainable - In other words completely pimped out! My dream dollhouse would include a living green roof. solar panels and lights with motion detectors to turn off when the room is not in use. i would add a Louis Ghost Chair! Geothermal, rain barrels, solar panels, low-e windows! Upcycled discontinued finishes from interior designers' sample libraries. my dream (doll) house would have a cellar for food storage, and a greywater recyling system. I'd like to see a rainwater gardening system with fruit and nut trees, root vegetables, spices, etc. Living in Florida and in an urban neighborhood, we want to add rainwater harvesting features to our property. We have a cistern planned; will go in when we can finally be able to renovate and add to our little house. I would like to have a water recycling system and solar energy panels in my dream home, for me and my little baby boy. I would agree with the majority and say solar panels. My dream house would have a deliberate connections from the kitchen to the garden, (i.e. composting system), and chickens. I earned a scholarship to attend a course in sustainability at a sustainable school in the Bahamas that was self-sustaining, from solar and wind power, to composting, gardening, making their own fuel, cisterns built below to collect rain water for all water needs, being conscious about waste, consumption, and use. This was a great experience. This would be my ideal way of living. This event pushed me farther into thinking about sustainable living, and I would love to own a doll house to share this kind of living with my daughter. The green design features that my dream dollhouse (or full-size house) would include are solar energy, other self-sustaining features as above, as well as sustainable and healthy materials. We are looking into these for our home, and we continue to work on achieving the rest slowly, as we change habits as well. I would add a functional rain collection and recovery system. kids love to play with water! Solar panels for my dream dollhouse. Solar panels, rainwater recycling, a large airwell to keep the home cool in the centre, and a roof garden where I can grow vegetables and herbs for my real house. This dollhouse is so cool! What a great way to teach your kids about the aesthetics of modern design and benefits of green living -- something that is a challenge living here in traditional, behind-the-times Baton Rouge, LA! I would love to see solar panels, a rooftop garden, compost and recycling bins, greywater recycling, a place to plug in an electric car, radiant floor heat, recycled and salvaged materials to add a little wabi-sabi-ness to the modern/new feel, like antique cypress beams or old barn wood and recycled glass and cement countertops. My green modern house would include lots of art by local artists and huge glass Nana walls for indoor/outdoor living. My dream dollhouse would have an indoor pool heated with solar panels, and a huge tree growing inside their room that kids could climb, or swing from. I also love the look of eco-friendly furniture. Bamboo and green leaves. Maybe even a pond with fish inside. Okay, so these are crazy ideas, but if we're dreaming, dream big! Greywater system, solar panels, composting system,hmmm.... what else can one dream up? So many of the comments above echo my own, but while I'm dreaming about my ideal house it would be entirely self-sufficient (energy generation and water recycling system) with an indoor garden able to provide year-long produce; green-landscaping (almost there already but there is need for improvement); open floor design meant to maximize energy efficiency and provide plenty of room for my daughter to play with her new dollhouse (hopefully); and my sweet family around me playing and enjoying one another. If I can't make all of that happen at my real home, I would love to have a dollhouse with all of the same features! I wish they made doll houses like this when I was a child. It truly is a dream house and the fact that it is eco sustainable is even better. This is a house that I could actually play with my children about and educate them about some of the things we talk about and people can do in their homes. I would love to have the newer eco toilets that have solar energy throughout and 2 buttons for flushing urine and bm, so that we are not wasting so many gallons of water. Recycled materials for counter tops and bamboo floors, etc. my house would have solar panels. a mini compost tumbler and rainwater collector! a geothermal pump! that is asking for a lot, but it would be so cool! my dream dollhouse (and real house) would be completely constructed from reclaimed and recycled materials as much as possible. i love the idea and the look! My dream house would have solar panels, a composting toilet, and one of those walls that stores heat and releases it at night. 1. I subscribe to your newsletter 2. I like you on FB as Holly Storm-Burge 3. My dream house would be completely powered by solar energy. Thanks! My dream house would have solar panels and be built of eco-friendly materials. my doll house letter box would have a no junkmail sticker :) to cut back on paper manufacture and save some doll house world trees!! I woud love a house with solar panels or one built just like the Emerson! It's just beautiful.